When it comes to the regular season there’s nothing more important than games against a division rival. Grabbing two points while keeping two points out of the hands of another team fighting for your playoff spot can be the deciding factor in which team qualifies for the playoffs. Last season, the Los Angeles Kings didn’t take advantage of some pivotal divisional match ups and it cost them in the end. The importance of winning games against another team that calls the Pacific Division home was never more apparent than when the Kings were eliminated from playoff contention last season. The Kings came out on the wrong side of a 3-1 score in their last game of the season against Calgary, which gave the Flames two points and opened the gap between the two clubs big enough to where Los Angeles would not be able to catch Calgary. 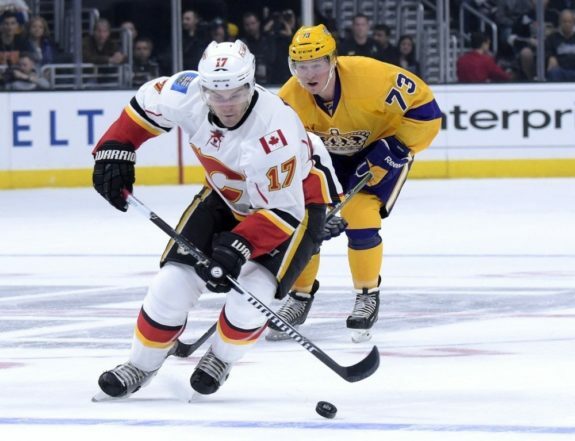 That four point swing solidified Calgary’s chance to make a run at the Stanley Cup, and at the same time torched the Kings’ chances at defending their crown. Drew Doughty recently weighed in on the importance of winning the season series against the Kings’ division rivals. Yeah, our division is obviously very tough and the two teams that beat us to get into the playoffs were Anaheim and Calgary. In our series against both of those teams, I’m pretty sure we lost. That was a big reason why we didn’t make the playoffs. So this year, division games mean a lot more than they ever have before and we’ve got to win all those series. Los Angeles did put up a respectable 14-7-8 record against the Pacific Division last season. However, like Doughty mentioned above, the Kings went 1-1-3 and 1-2-2 against Anaheim and Calgary respectively. Gaining eight of a possible 20 points against division rivals simply wont cut it. When you look at the Kings’ records against the remaining four Pacific Division teams, it is not surprising that the Kings finished above three of the four teams. The Kings boasted a 3-1-1 record against Edmonton and finished 33 points ahead of the Oilers. Los Angeles won their season series against the Coyotes with a 3-0-1 record and finished 39 points ahead of Arizona. This is as close to perfect as you can get and it shows in the gap, which was also aided by Edmonton’s and Arizona’s poor overall season, between the Kings and the other two clubs. On the other hand, the Kings’ series with the San Jose Sharks was much closer. Los Angeles won the series 3-2-0. All games were decided in regulation which made grabbing the win even more important. At the end of the season the Kings had 95 points, while the Sharks grabbed 89. The Kings’ three wins against the Sharks gave Los Angeles their spot ahead of the Sharks in the standings. If the record was flipped into the Shark’s favor then it would have been the Sharks just missing out on the post season and the Kings a few spots lower in the standings. The one series that doesn’t match up like the rest was the Kings’ series against the Vancouver Canucks. The Kings went 3-1-1 against Vancouver last season, but finished six points behind the Canucks in the standings. The Canucks made up for their shortcomings against the Kings by winning eight more games than the Kings, which propelled them into the Pacific Division’s second playoff spot. When matched up against the Pacific Division the Kings came away with 36 of a possible 58 points last season. With one more win against the Ducks and Flames the Kings total against the division could have jumped up to 62 and gotten the Kings a new total of 99 points. That new total would have gotten the Kings into the playoffs. But that is just living in the past. On paper it looks as if the Pacific Division, as whole, has improved this summer. Which means games between division rivals are going to be tougher and have an even bigger implication on the standings. If the Kings hope to rebound and make the postseason they are going to have to start by winning close to all of their season match-ups with the Pacific. Any points left on the table for a division foe could spell an early summer vacation, a fate the Kings are all too familiar with.